Posted on 10th October 2018 at 11:36 am. With our increasingly busy lifestyles, it comes as little surprise that many of us are choosing to have gardens that are as low maintenance as possible. Finding the time to maintain plants, shrubs and a lawn can be a difficult task for many of us. Even if you have little interest in gardening, the chances are you’ll want your garden to look nice and be a welcome oasis away from the stresses of everyday life. Luckily, having a nice garden doesn’t necessarily mean that it will take up too much of your free time. By carefully planning your garden and following some simple low-maintenance tips, there is nothing to say you can’t have the best of both worlds. We recommend that you start by choosing some low-maintenance shrubs, to fill the beds and borders of your garden. To help you, we have compiled a list of 10 of our favourite low-maintenance shrubs that will be a welcome addition to any garden, large or small. Many of the shrubs on our list are classed as ‘evergreens’, meaning that they will look good all year round, and yet they tend to require less pruning and maintenance than many other plants. So, let’s begin with the first shrub on our list. Buxus are ideal topiary for modern and contemporary style gardens, where they are typically planted in containers. They are often used to form hedgerows, too. This slow-growing evergreen shrub requires surprisingly little maintenance. It tends to thrive best in shady areas and can even be grown underneath trees. Excessive sunlight can cause discolouration in the leaves. 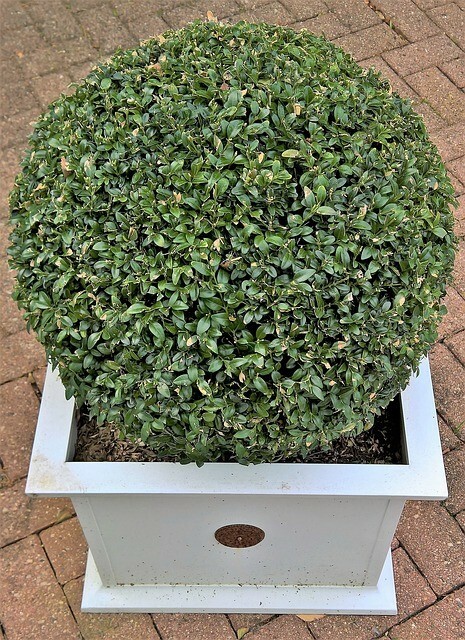 Buxus can be left to grow as it pleases, but should you choose to keep it in an ornamental style then it will, of course, need the occasional prune to help it keep its shape. That’s best done once a year, at the end of August. This glossy-leafed shrub is, as the name suggests, a native to southern Japan. Fatsia japonica is an evergreen shrub with sparsely branched stems, that grows to a height of somewhere between 1 and 3 metres. It makes the perfect addition to borders or, alternatively, works well as a feature, in a large container on a patio. In autumn and early winter, it produces a small white flower, followed by small black fruits in the spring, so offering different interest at different times of the year. It will grow best in moist, good draining soil situated in partial shade or full sunlight. Fatsia japonica has made our top 10 as, once established, this shrub is fairly low maintenance and needs little or no regular pruning – perfect! Another popular choice of shrub for low-maintenance gardens in the UK is the humble Red Robin. Red Robins are evergreen and can grow to anywhere between 2.5 and 4 metres in height, with a similarly sized spread. 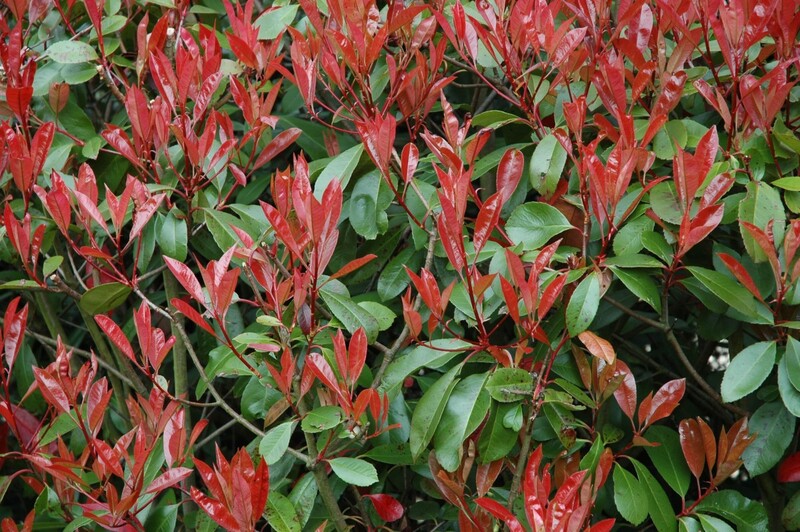 This lovely shrub would make the perfect addition to any garden and its beautiful red leaves make for an eye-catching feature. Like all of the shrubs on this list, Red Robins require virtually no pruning at all; in fact, pruning can potentially spoil the shrub, if done incorrectly. As long it is grown in moist soil, in full sun or partial shade, Red Robins are about as low maintenance as it gets. Holly instantly makes us think of Christmas, but this evergreen shrub looks fantastic all year round and deserves a place in any garden. 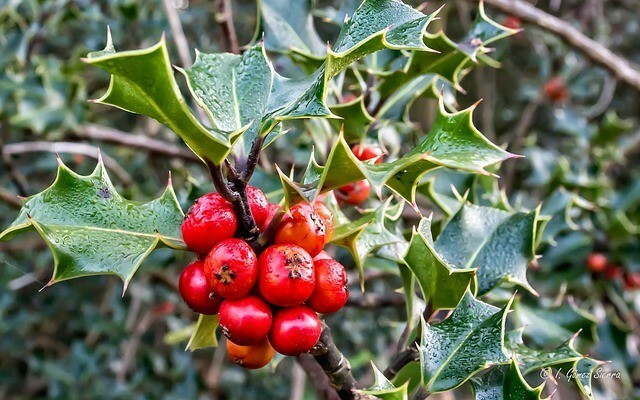 With its distinctive spiky leaves and red or yellow berries, holly is perfect for creating a dense hedgerow. The shrubs also make outstanding specimen plants in the garden, or as part of a mixed border. This evergreen shrub is very slow growing, meaning pruning is minimal, but they can actually grow to a whopping 25 metres in height. The berries, which ripen in the winter months, provide a welcome food source for birds; however, they cause stomach upsets in humans, if ingested, so if you have young children, this may be one to avoid. Holly tends to thrive best in full sun or slight shade, and it likes well-draining soil. The next shrub on our list is the Choisya ternata ‘Sundance’, winner of the RHS Award of Garden Merit, which was given for its shape and colour, and excellent resistance to pests and disease. 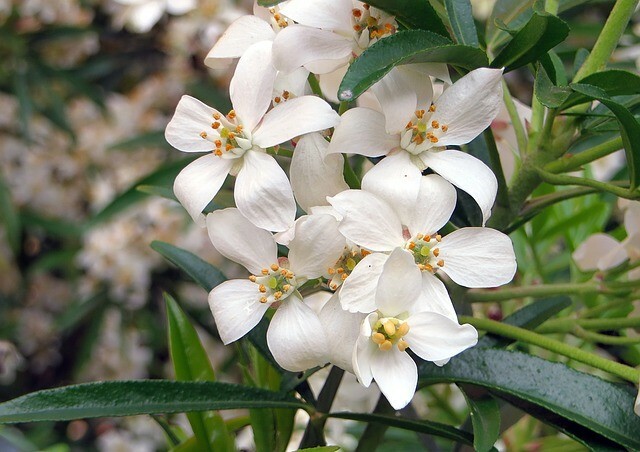 Choisya ternata grows to 3 metres in height. It can be instantly recognised by the shape of its aromatic leaves, which are referred to as palmately divided (hand-shaped). It also has scented white flowers. This shrub requires very little, if any, pruning and is best grown in sheltered areas of the garden that receive plenty of sunlight. This evergreen shrub is named after plant explorer and Scottish botanist, Robert Fortune. It has leaves that are elliptical in shape and arranged in opposite pairs; they grow to between 2 and 6 centimetres in length, and 1 to 3 centimetres in width. Euonymus fortunei can offer up wonderful tinged pink leaves during late autumn and early winter, creating an eye-catching display of colour. 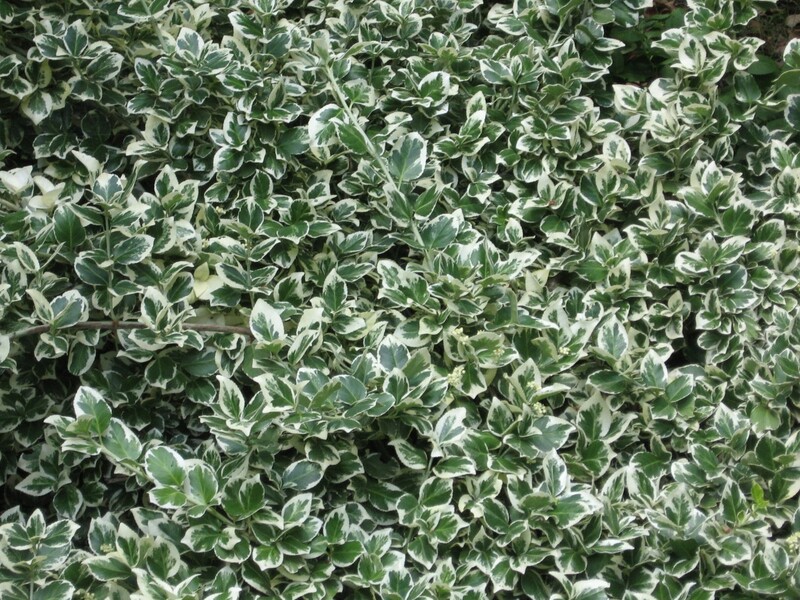 It is one of the smallest shrubs on our list and typically only grows up to 1 metre in height. Its slow growing nature means that, once established, it will require very little maintenance or pruning. This small bushy shrub can also be trained to climb up walls, pergolas and trellis panels, and when climbing they can, in fact, reach heights of up to 20 metres. Euonymus grows best in well-draining soil, situated in full sun or partial shade. When it comes to choosing low-maintenance plants and shrubs for your garden, it’s important to not only choose them based upon aesthetics, but also to consider their aroma. And high on the list of beautiful, fragrant shrubs is lavender. It is a versatile shrub that can be used as edging or in patio containers, and its flowers are highly appealing to bees and butterflies, which will encourage the local wildlife to visit your garden. 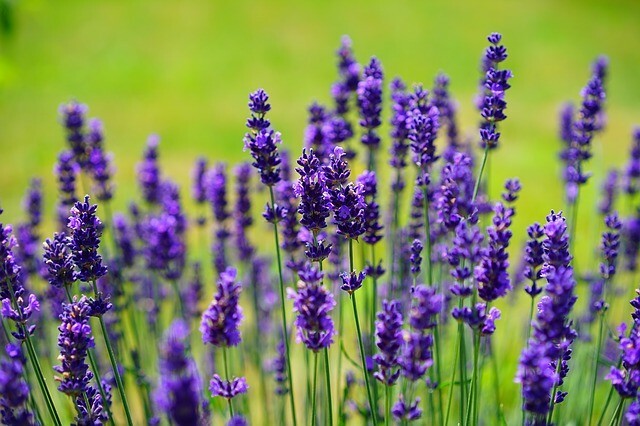 Lavender is also extremely easy to grow; it thrives in dry conditions, in sunny areas of your garden. You may wish to prune lavender once a year, either in the spring or late summer, to keep it compact. Using secateurs, remove the flower stalks and around 2 to 3 centimetres of the current year’s growth. 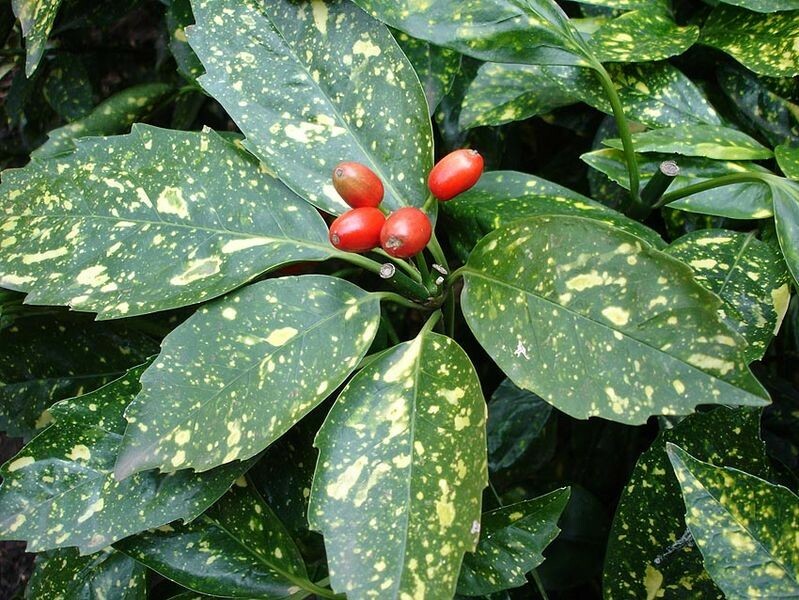 Aucuba japonica was first brought to the UK by John Graeffer, in 1783, and it quickly became known as the ‘gold plant’. Aucuba are dioecious evergreen shrubs, with leaves growing to between 5 and 8 centimetres in length, and 2 to 5 centimetres in width. 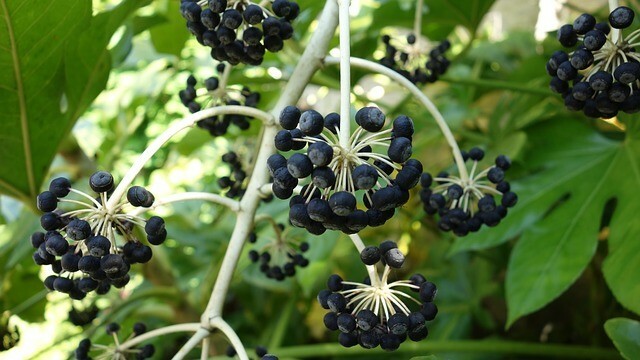 They sprout small purple flowers, followed on female plants by large, glossy, red fruits. They offer a variety of different colours during different times of the year, to give your garden a different dimension with each passing season. Aucuba loves shady areas, so pick a part of your garden that receives little direct sunlight, preferably north facing. They grow up to 2.5 metres in height and love well-draining soil. Daphne, like lavender, is famous for its beautiful scent and would make a welcome addition to any garden. They are typically grown in beds and borders to provide texture and colour, and the smaller, alpine species can also thrive in patio containers. We recommend that you keep them close to pathways and patios, which will allow you to enjoy the beautiful fragrant scent produced during the winter and spring months. Daphne are certainly one of the most attractive-looking shrubs on our list and will display beautiful pink flowers, set off nicely by the glossy, yellow-edged leaves. 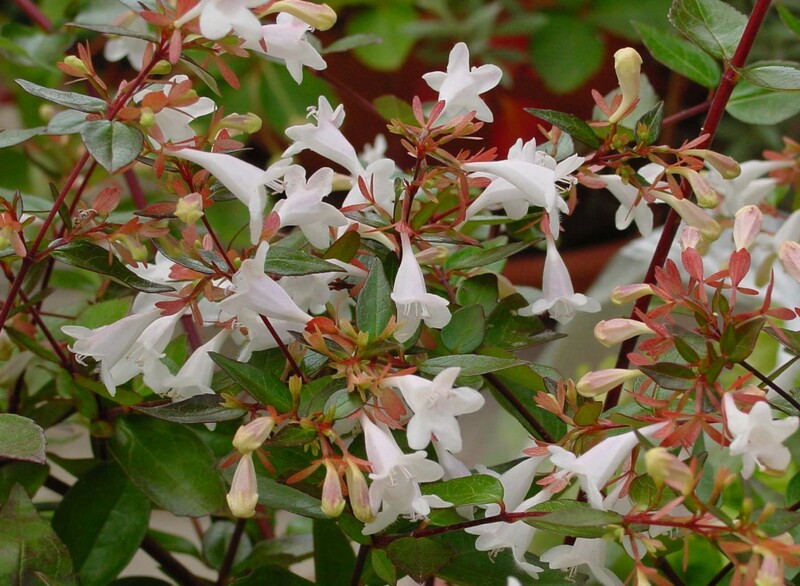 We think abelia is an underrated shrub amongst the gardening community. 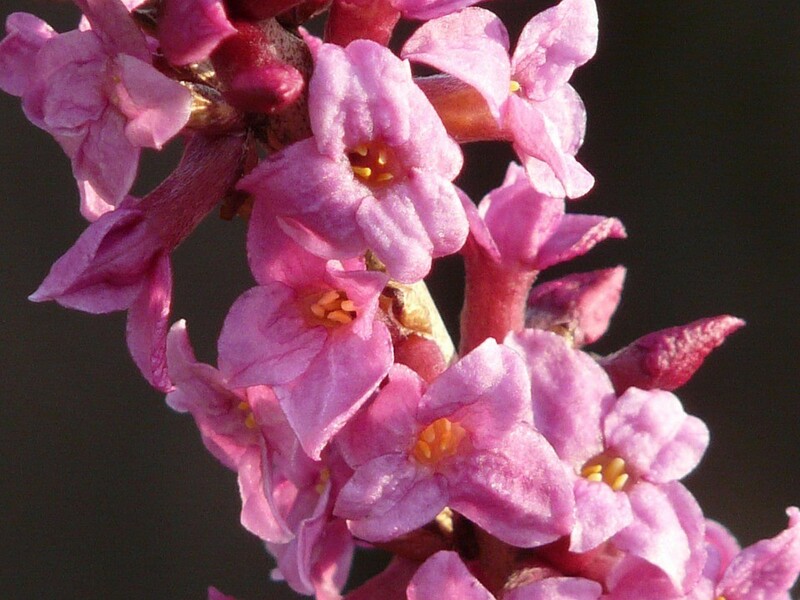 It is a semi-evergreen shrub that can give months of interest with its attractive colours and light, fragrant scent. It is medium in size, growing up to 3 metres in height, and has small, glossy, oval leaves and clusters of pale pink flowers. An added bonus is that abelias are extremely resistant to pests and disease. They are best grown in sheltered areas that receive plenty of sunlight, so position them in a south-facing corner of the garden and you’ll be rewarded with a stunning low-maintenance shrub that will certainly catch the eye for a large part of the year. There is nothing to be ashamed of in opting to create a garden that is as low maintenance as possible, particularly when some of the most stunning shrubs happen to be low maintenance, too. We believe that a garden should be something that’s enjoyed, not a place of work, and by carefully selecting low-maintenance shrubs and plants, you’ll create a garden that not only requires very little of your precious spare time, but one that will look amazing all year round. Besides planting low-maintenance shrubs, there are many other ways in which you can make your garden as low maintenance as possible. In recent years, artificial grass has become very popular, even amongst traditional gardeners. If you are considering having an artificial lawn, then why not request your free samples and see for yourself just how amazingly realistic our fake grass products are? Which of the shrubs included on our list is your favourite? Is there anything that you feel we should have included, but didn’t?